Do you want to make your WordPress blog completely private? Often we get requests from parents who want to use WordPress to share baby photos with friends and family. In this article, we will show you how to make your blog completely private. We will also cover how to create a private and password protected post in WordPress for those who want to have a public blog with a private area. When and Who Needs a Private Blog? A private WordPress blog is useful for sharing your family events, wedding photos, baby pictures, etc. with friends and family. See some of the best WordPress themes for family blogs for inspiration. A private blog can be used as your own private diary or journal. Teams working on projects can collaborate on a private blog. An under construction website that is not yet fully ready for public viewing. A classroom website can be made private and accessible only to registered students. First thing you need to do is install and activate the My Private Site plugin. For more details, see our step by step guide on how to install a WordPress plugin. Upon activation you need to visit Settings » Private Site page to configure the plugin settings. First you need to check the box under ‘Make Site Private’ section to enable the plugin and make your site private. 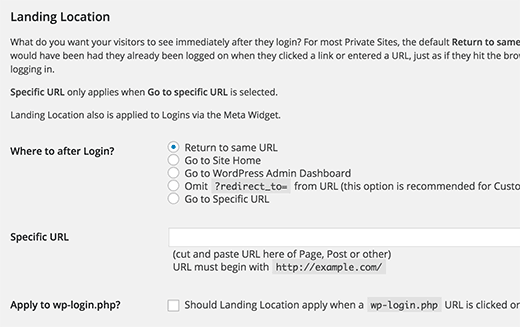 The next section is to allow users to register on your WordPress site. If you don’t want users to be able to register on your site, then you can skip this section. Under ‘Landing Location’ section you can choose which page users will see when they login. By default, the plugin will return them to the same URL they requested before login. You can also redirect users to homepage, WordPress admin dashboard, any other URL on your WordPress site. My Private Site plugin also allows you to exclude some parts of your website from being private. For example, if you are using a static front page and want users to see it, then you can add it as an exclusion. You can also add other URLs like a contact form or about page into exclusion list. That’s all, people visiting your website will now be asked to login before they can view your website. Depending on your settings, users may be able to see excluded pages or they will just see the login page. WordPress comes with a built-in feature which allows you to make posts or pages private and password protected. 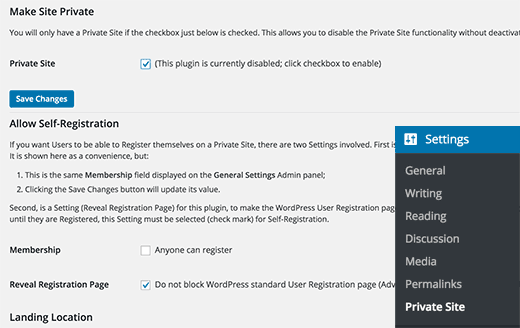 Here is how to make a WordPress post private. You need to start by creating a new post in WordPress or edit an existing one. 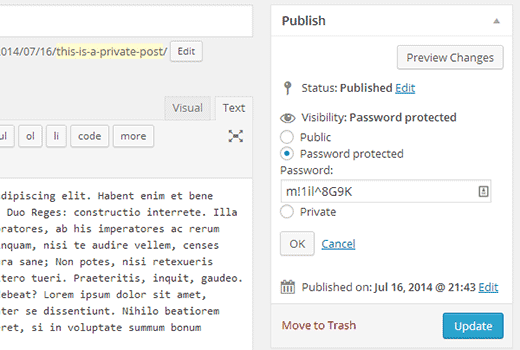 On the post editor screen, you will see the Visibility option under the publish meta box. Click on the Edit link next to visibility. There you will see the options to make a post Private or add a password protection to the post. Choose the appropriate radio button to make a post private or password protected. If you choose to make a WordPress post password protected, then WordPress will ask you to enter a password. Users will need to enter this exact password to view the post. You can send this password to friends and family by email, and they can view the post by entering the password. Important: Please note that users with the user role of Editor or Administrator can view a password protected or private post by logging into the WordPress admin area. However if you are the only user on your site, then you don’t need to worry about that. For more information please see our guide on how to add or remove capabilities from user roles in WordPress. We hope this article helped you create a completely private WordPress blog and posts. It is a great way to share your things with select people on your own website. The organisation that I work for is looking to advertise their website and services (which are usually entirely private and password protected) on Facebook to non-users of the website. Is there a way to publish a partially private page? I have made the posts on my blog ‘password protected’ but two of my laptop/phones still show site in full ie with no password protection ! No, it will not stop search engines from crawling. However, search engines will not be able to see content. Do I need to have Business Plan in order to install My Private Site? This is silly and convoluted. With such a robust and established platform, why isn’t there a simple box already in settings which allows you to make your blog private while in construction? There is a box provided to make your post private by checking the “password protected” option. You have to give the password to your private readers. Otherwise the best alternative is to make a membership site, which can be paid or free. the username and password that was used on the login screen, is that the same username and password to access the backend admin area, or do we need to create a new username and password for those who are registering ? This I think reply is private. Thanks for the tips! I just started out a little over three weeks ago. I am planning on setting up my e-mail list this week, and I was considering using Mad Mimi. Thanks for the tutorial! I was reading a tutorial on WordPress….org not WordPress.com. he indicated the private setting is only on the WordPress.com venue not the WordPress.org. I want to be an invite only blog privately. Will I need the use the WordPress.com and not WordPress.org venue to do that? The private only plugin has a security flaw. Thanks for notifying us. We have updated the article and added a new plugin. The “Private Only” plugin referred to in this (and many other) posts appears to have disappeared sometime in the last two years. Is there an obvious successor plugin? I’ve searched and tried some others but none appear to fit so well for my purposes as the lost “Private Only”. Might it be it only changed name? Any ideas? We have updated the article with a new plugin ‘My Private Site’. Please give it a try. I am not seeing (on my private wordpress blog) where I can set a password for users to log in? I tried to follow all the steps… but must be doing something wrong. I wonder if I visited a private page (in which I am given the password already) will the author be able to tell who sees that page? Will the author know that I see the page? Or put it in this case. There are two people, A and B. B is my friend, A don’t know anything about me. A has a private post but only B is allowed to see it. B, being a friend of mine gladly gave me A’s password without A knowing it. Will A be able to find out that I saw the page? This is confusing. If I have a site which is private, I have the option to make “public” posts. What happens then? Are they still hidden from public view, or not? Why don’t you all explain how these two functions work together? Nice Plugin! But how do I protect files in my uploads folder which could be a part of a post or a page? E.g. someone uses the URL of a picture everyone who get the URL have access to this picture. The article you linked is for WordPress.com not for self hosted WordPress sites. How can you protect complete theme & plugin information ? its possible to detect the framework and theme ,plugin used. Is there any way to limit access to a portion of my website to users with specific email addresses that I set up ahead of time? Yes you can use a membership plugin. Or if you are doing this for a specific purpose, such as using an LMS or teaching plugin, usually these plugins will have that ability built in. @wordpressbeginner:disqus What are the Pros and Cons of creating a Private Blog??? There is no « Pros » or « Cons » ! You need, or you don’t need, a private blog.